Join us for a 5 k Neon Fun Walk/Run on September 22nd! Sponsored by verify. and the UNK Women's Center. 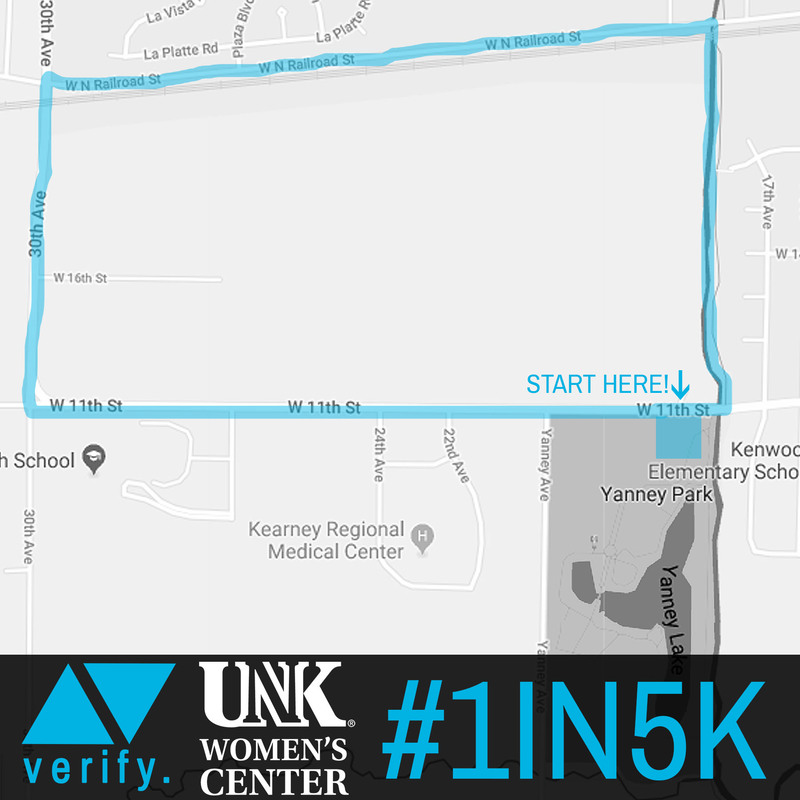 The fun run will begin at 9:00 a.m. at the Peterson Activity Center. See the map of the route below. Cost is $20.00. Register by Wednesday, September 12 to guarantee your choice of t-shirt size. Cost includes an event t-shirt and water during the event. Participants may register the day of the event. Proceeds benefit verify. a prevention focused youth group sponsored by The S.A.F.E. Center. Funds will help the group promote healthy relationships for youth in our community. This is a rain or shine event. Regardless of weather conditions the event will continue. No refunds will be issued due to weather or inability to attend. We all have a unique role to play in prevention and changing the culture around sexual violence. It’s time for everyone to find that voice and embrace it. The S.A.F.E. Center, verify, and UNK's Women's Center are happy to come together to spread this message of prevention. If you or someone you know has been sexually assaulted, reach out to The S.A.F.E. Center on their 24 hour hotline 1-877-237-2513 or RAINN's 24 hour hotline 800-656-HOPE(4673). All proceeds will be given to The S.A.F.E. Center which provides free and confidential services to victims of sexual and domestic violence. For more information about The S.A.F.E. Center visit www.safecenter.org. This event is sponsored by verify, The S.A.F.E. Center, and the UNK Women's Center. For more information, click on the links below.